The Plus Series from Clevertouch is the most advanced interactive touch screen available with an Integrated Android operating system and internal hard drive you can teach without the need for a PC, it comes with 10 points of touch, a toughened 4mm anti glare screen, Touch-control menu for on screen input selection,complete woth wifi wireless dongle, integrated speakers along with multiple VGA, USB & HDMI Connections. 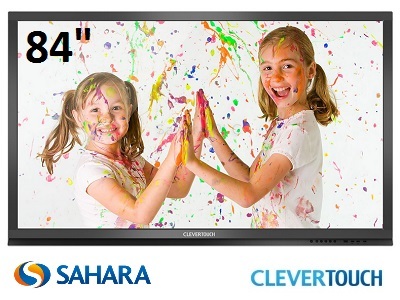 Cleverstore Apps - Exclusive to Cevertouch Plus a range of applications designed to for interactive touch screens which can dramatically alter your classroom dynamic. CleverLynx is an annotation software where you can import any type of document and make notes over it. The annotation toolkit includes pen, paintbrush, highlighter and fill area. Screen capture allows you to save these annotations. An image bank and wide variety of maps are available. AV Installs Ltd also provide a complete range of professional installation services for all makes of Interactive screens for more details contact us. 84" Ultra HD 4k screen. Narrow bezel and modern design. Front mounted USB ports for Android and PC. Inbuilt PC with 4K graphics. Integrated Android operating system and internal hard drive. Touch-control menu for on screen input selection. Optional PC features Intel® Core™ i5 PC . Ships with Cleverlynx, Snowflake & Displaynote software.